It is meanwhile undisputed that biodiversity and ecosystem services are threatened by global environmental change (land use and climate change). This particularly holds for one of the hottest global hotspot of biodiversity, the southern Andes of Ecuador. However, in this complex eco-region, ecological knowledge, particularly on global change effects, is still limited. Sustainable land use management as a precondition for biodiversity protection is hardly developed, and monitoring systems for the surveillance of global change impacts on biodiversity and ecosystem services are neither developed nor implemented. While the first cries out for basic research activities, the latter should adjoin science-directed development and implementation of suitable strategies and tools. 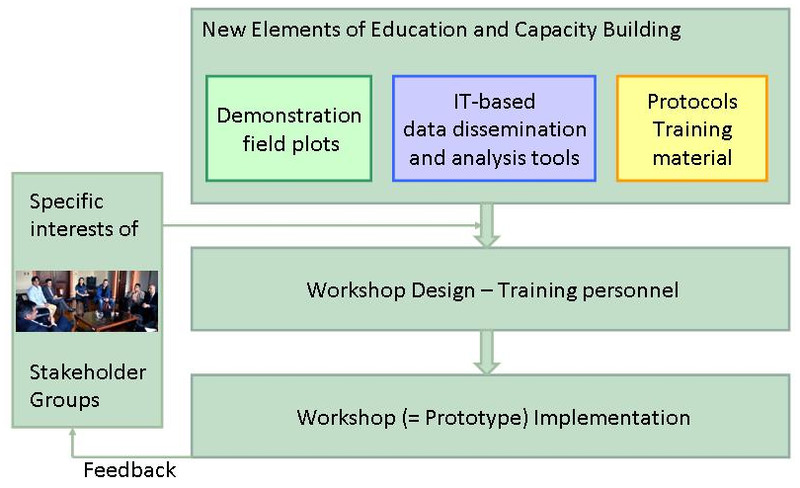 A knowledge transfer subprogram (C) to develop and implement a monitoring system applicable for early warnings regarding environmental change impacts on biodiversity and ecosystem services. A central objective of the program is to conduct capacity building and training on all levels, ranging from university to local communities. This is considerably supported by our non-university partners.The platform program is based on 16 years of ecosystem research in southern Ecuador, particularly in the scope of the DFG Research Units 402 and 816, which provided ample baseline knowledge and data. The aims of the program are in full compliance with the aims of the national environmental policy (Plan Nacional para el Buen Vivir), and the aims of CBD (Convention on Biological Diversity) and IpBES (Intergovernmental Science-Policy Platform on Biodiversity and Ecosystem Services). The program is designed as a transdisciplinary endeavour linking Ecuadorian and German scientists as well as relevant stakeholders from politics to local communities. The design process considered the novel strategy as proposed by ICSU (International Council for Science) for the Program „Future Earth“:Co-Design and Co-Production. The commitment: A transdisciplinary inauguration group encompassing bi-national scientists (university partners) and relevant stakeholders (non-university partners) developed the framework of the program by emerging and formulating major needs of the Ecuadorian society. Main topics turned out are the protection / rehabilitation of biodiversity by means of sustainable management strategies. Protection / rehabilitation strategies also should consider the central service of interest, water regulation, which is particularly threatened by environmental change but indispensable for the Ecuadorian society regarding hydropower generation and potable water supply. For the detection and mitigation of adverse global change effects, the development and implementation of an indicator system for monitoring turned out to be of major importance, too. The transdiciplinary character of the program results in a tri-pole structure of the contributing consortium (Fig. 2). Two German (DFG funding) and Ecuadorian (SENESCYT funding) cooperative research programs linked by a framework memorandum of understanding between the respective funding agencies form the basis of joint research and development on the platform. It should be stressed that this is the first time of a collaborative environmental research program in Ecuador encompassing four leading universities of South Ecuador (UTPL, UNL, UDA, UC). 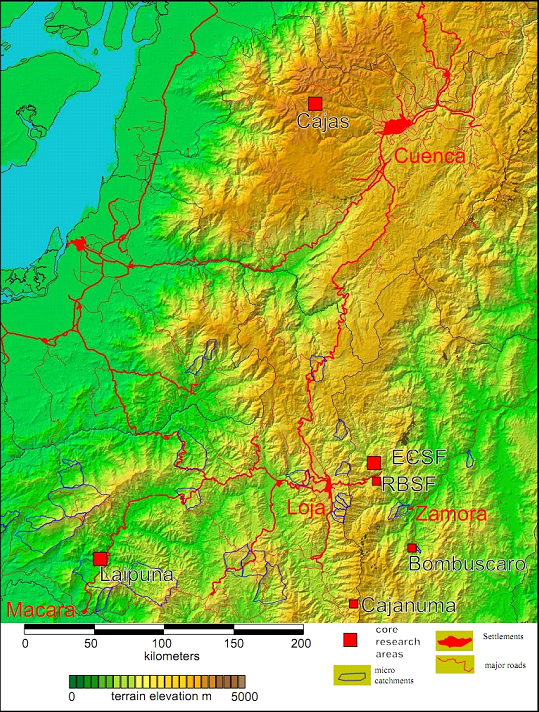 Knowledge transfer, implementation and contribution of basic indicators is topically and financially supported in the consortium by four most relevant non-university partners: The foundation Nature and Culture International (NCI), the public utility of the city of Cuenca (ETAPA), the regional water fund of South Ecuadorian municipalities FORAGUA and the environmental agency of the city of Zamora (Gestion Ambiental Zamora). Besides the specific field sites, remote sensing, GIS and numerical model technology is applied to provide area wide, spatial explicit information for the whole region of southern Ecuador (Fig. 3). The map shows that the selected sites warrant an altitudinal gradient from 1000 to 4450 m asl.